Hearing that I was coming to Izeafest in Florida Eric invited to me come and meat the Clickbooth team in their offices. Then he asked me to come early, very early 7.00 am early. Then I found out what they had planned. Eric Schechter and the team at Clickbooth took me deep sea fishing. Now that is how to look after affiliates. 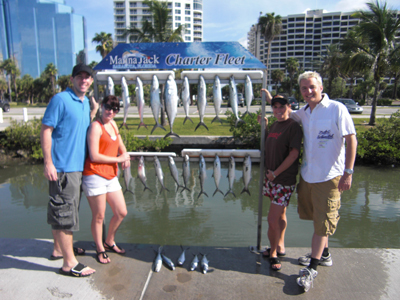 We had a great time on the boat and caught a lot of fish. Eric who had clearly been in training (by a pond) caught the largest fish. I would like to take this opportunity to official welcome Clickbooth to my blog as a sponsor. After the fishing trip down to business and I went on a tour of the Clickbooth offices, I meet the whole team from the CEO to the receptionist who it turns out is quite talented. There is a lot of video to come from that trip. There is a real family environment with everyone working together to make things happen. The moment you walk in the door to the time you leave people are looking after you and taking care of each other. No wonder they are growing so fast. FTC notice. Yes Clickbooth sponsor my blog and yes I am an affiliate on their network. No members of the FTC were hurt in the production of this post. Very good information, thank you very much by the article and the quality of your Web site. A greeting from Chile.